The Child by Jan Hanh was a much-anticipated release for me as I had been waiting for the last three years for her to release a new book. She is one of my favourite authors, I absolutely love all her books and if I think of it, The Peculiar Connection is my all time favorite JAFF book, so as you can see, expectations are very high when it comes to Jan Hahn. 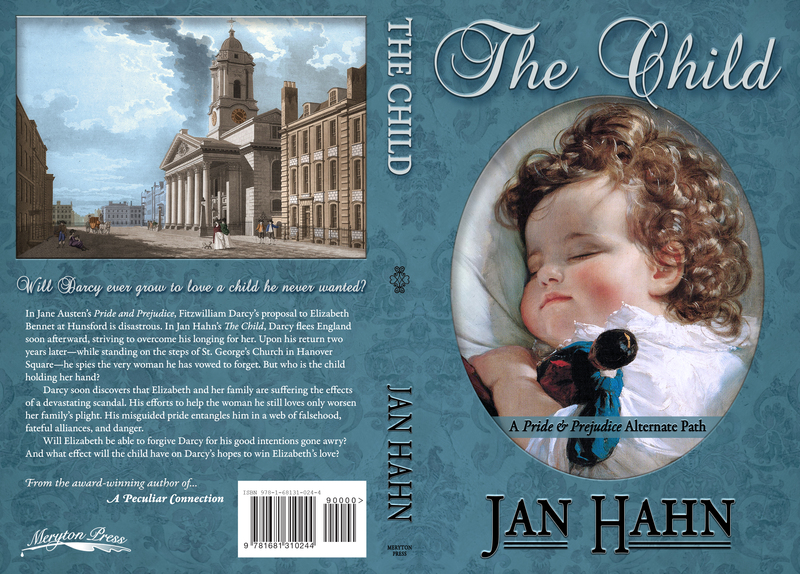 The plot of The Child is very different from Jan Hahn’s previous books, in this story Darcy flees England soon after the Hunsford proposal to try to overcome his longing for Elizabeth. Upon his return two years later―while standing on the steps of St. George’s Church in Hanover Square―he spies the very woman he has vowed to forget holding a child by the hand. Disturbed by this, he soon discovers that Elizabeth and her family are suffering the effects of a devastating scandal. His efforts to help the woman he still loves only worsen her family’s plight and his misguided pride entangles him in a web of falsehood, fateful alliances, and danger. On the other hand, that first encounter proves to be equally difficult for Elizabeth as she sees the man she loves being taken away to a wedding that will not occur without him, and where an expectant bride is waiting for him. If you are a frequent visitor to my blog you know this premise is just perfect for me as it contains all the ingredients for an intense journey of angst and misunderstandings that our characters will have to take before finding their happiness. But do not fear if you are not so favourable to angst as it does not last as long as I would expect, the book has just the right amount of it for everyone to enjoy it. In these initial chapters, and while those events take place, Jan Hahn literally plays with words to keep the suspense on the book in an exquisite manner, I love how she arranged every word and ever sentence to prevent Darcy from finding the true story behind the child, it takes a true proficiency to play with words like that and the consequence is that once we start reading, we just can’t stop. 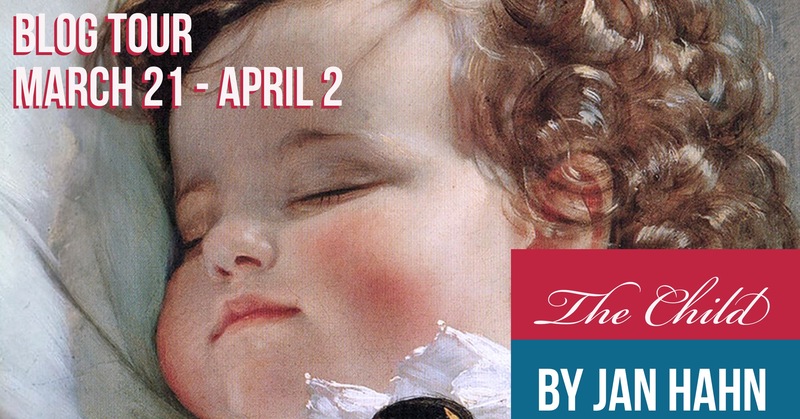 As the story progresses and the plot thickens, Jan Hahn ventures into a plotline that I usually dislike, and that is when I reconfirmed how an amazing writer she is, because despite that detail that always pushes me away from a book, I loved The Child. Darcy is challenged to overcome his pride, and his love for Elizabeth is tested in a way that will make him a better man, a better person than myself if I am truthful, as he comes to accept some things much sooner than I did (again, I have issues with this detail in every single JAFF book). The book is entirely from his point of view and this will allow the reader to better understand all the struggles he is facing. It allows us to establish a bond with him, and who doesn’t’ love that in a book? 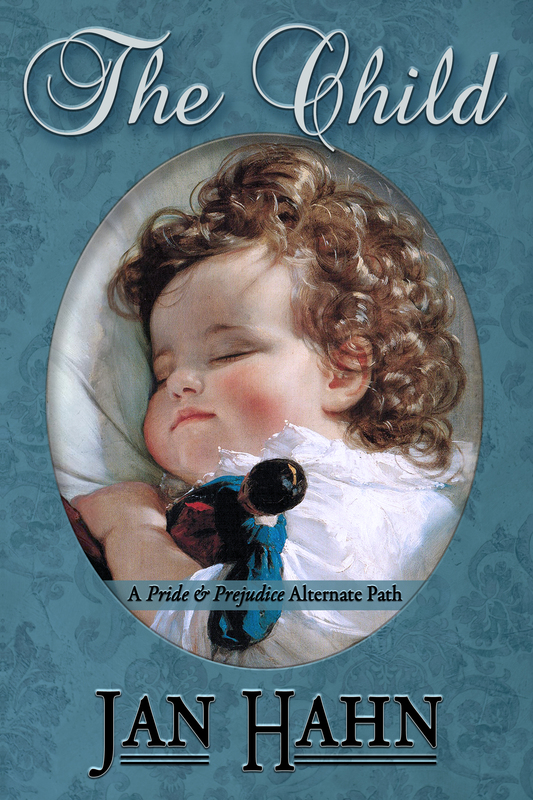 It was one of the aspects I loved the most in this book, I really related to Darcy and understood everything he went through, I’m glad The Child was told from his point of view, because I can see myself relating to him much more than I could envision the same thing happening with Elizabeth in this story. The prologue was a balm to my soul, I think it allowed me to come to terms with the entire story and to finally let go of my prejudices and accept that people need to be seen for who they are and not who their parents are. I can honestly say that I believe most readers will love this book, particularly those who have children because they will better understand that a mother is not the one who carries a child, but the one who cares for and loves that child. P.S – I have to mention the cover, isn’t it PERFECT?!!! 8 eBooks of The Child are being given away by Meryton Press and the giveaway is open to international readers. This giveaway is open to entries from midnight ET on March 21 – until midnight ET on April 4, 2018. Readers may enter the drawing by tweeting once each day and by commenting daily on a blog post or review that has a giveaway attached to this tour. Entrants must provide the name of the blog where they commented. To enter it please click on this link. Me too Patrícia, Janet is very talented! Her covers are always amazing!!! I agree… that cover is amazing. This story sounds amazing. I registered for the give-a-way… thanks for the option for people like me who don’t have any of the social media options [Face, Tweet, etc.]. Blessings to Jan Hahn on the launch and success of this book. Thanks Rita for hosting. Good luck in the giveaway Jeanne, I hope you get a chance to read the book. It’s also on KU, I’m not sure if you have it, but if you do take your chance at reading it because I know you will love it!!! Thank you for your kind words! I recently received your lovely Pemberley book as a gift from Janet Taylor. It looks gorgeous on my coffee table. What a great book! What a fabulous review, Rita!! I agree with everything you said about Jan’s talents as a writer. She brings such an emotive touch to everything that she writes!! And as a parent myself, I have to agree when you say a parent is the person who raises you. More time and tears go into raising a child than anyone can imagine and I loved how Jan explored this side of Darcy throughout this very difficult experience for him. I had to add that P.S Janet, as always you made a great cover! Simple but perfect in every way!! I love it!! Great review Rita. I love Jan’s books, so I’m sure I’ll enjoy this one as well. Thanks for the giveaway. What a wonderful review! I, too, have been waiting for another book from Jan Hahn. I have seen so many people moved by this story. I’m eager for my turn. Great review, Rita! Great review for what sounds like a wonderful book. Definitely on my list of books to read. Thank you for the great review, Rita! I’m really glad that you liked reading the book from Darcy’s viewpoint because I struggled with that aspect. In fact, in the beginning I toyed with the idea of telling the story from both Darcy’s and Eluzabeth’s POV, but I decided it would reveal too much too soon. I also agree with all those who like the cover. Janet Taylor outdid herself on this one. I read this book and, like you say, it captured my attention. It is unlike any other JAFF book but the author was so skilled (again, as you said) in how she worded her tale as well as when certain details were revealed, i.e., the gender of THE CHILD. Her nuances in looking back were creative while at the same time adding angst and intrigue to the story. Having worked in adoptions for many years, I do know how one can love a child “while not born of one’s body, but certainly growing in one’s heart”. I melted when a certain character “fell in love for a second time”. I urge everyone to read this also and I do plan to read it again. Sheila, I saw this review on Amazon, and it touched my heart. Thank you so much! The review was great, Rita. Good to learn what plot we can expect from reading The Child. I also agree that the cover is beautiful. Janet Taylor is one talented artist! I agree. Rita writes a great review and Janet is so talented. Thank you for your comments, Luthien. Lovely cover! Really looking forward to reading this! Thank you, Regina! I hope you like the story as much as the cover. Sounds like amzing book! Great post! Thank you! I hope you like the book. What a fantastic review!!! You certainly enjoyed this one! Looking forward to reading this especially as it’s told from Darcy’s point of view. Like you,I’m interested in gaining insights into his perspective, seeing how his mind works,what’s he’s feeling and how he internalises it to make sense of matters. And yes,the cover is undoubtedly unique,an obvious labour of love for Janet!!! Best of luck with your new book,Jan! Thanks for your comments, Dung! I’m glad you enjoy Darcy’s POV. I don’t plan on ever getting inside his head again. Much too much going on in there! 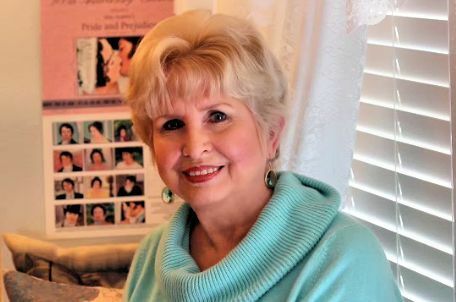 Congratulations on the new book, Jan! And thank you for the great review, Rita! I love Jan’s books and I have read them all, also the version of The Child online. But I am really curious to read this published version! Thank you for the giveaway! Thank you, Daniela, for your kind comments! The story’s the same as online, just a few changes. Wonderful review for an exquisite book. Such a beautiful and moving story, and so wonderfully written! And the cover is absolutely perfect! Thank you, Joana! I do love the cover. Thank you for this review, it increases my desire to read the book! It’s an excellent review, and I’m glad to hear you’d like to read my book. Thanks for commenting! Amazing review, Rita. Thanks so much for sharing it with us. I love a story told from Darcy’s POV and this one sounds exceptionally good. And once again, Janet’s done a wonderful job with the cover.